We are on the beautiful Andaman islands far away from the Indian mainland and it's not so sunny this time around, the monsoon is here and it's the best time for a drive around the island if you ask me. This because there is nobody in sight and only a handful of journalists driving the very first Nissans to enter this part of the world. It's the new Sunny that is slated for launch next month, the Japanese manufacturer has updated their entry sedan and it promises to offer even more this time. 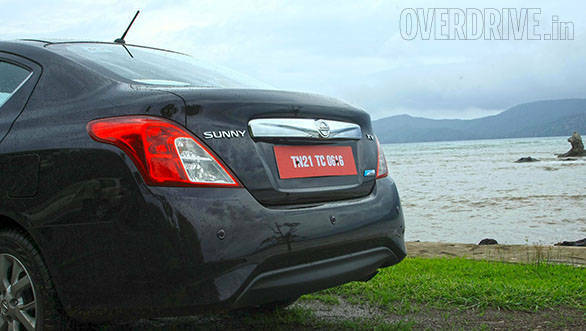 The Sunny is a unique offering, the car is only slightly more expensive than the best selling compact sedans but offers much more boot space and rear knee-room, not to forget comfort features as well. The company shifted its focus to the Terrano and more recently the Datsun Go, but the sedan has finally received an update. The biggest change is the new face, gone is the more rounded headlamp and in comes a sharp and larger unit following the boomerang design theme seen in various other Nissan models internationally. The increase in size makes it look out of place from most angles. The boxy grille has grown downwards and mimics the styling seen in the more premium Altima/Teana models. The fog lamp inserts even feature chrome garnishing while a chrome lip is also present in the top XV variant. There is an abundance of chrome but it actually adds a bit of elegance and presence since it contrasts well - especially if the Sunny is of a darker shade like the new Nightshade you see here. The sides are more or less the same, the fender design has been cleverly integrated into the new bumper and headlamp. The only additions being new Y-shaped alloy wheels that look unique and the window sealers that now get chrome detailing. The rear end is also different, the new bumper flows with the existing shoulder line and protrudes outward like a skirt. The rear garnish is larger while the antenna has now moved to the rear end of the roof. Parking sensors also make it to the top variant while the tail lamps are same as before. 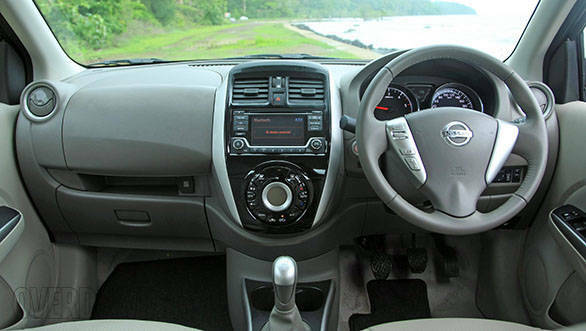 Inside, the centre console is a new piano black finished unit seen in the updated Micra while the gear knob is slightly different. The steering wheel is new, the three-spoke unit follows a triangular design and even features audio and phone controls, the buttons are very well detailed and work well. The instrument cluster is now backlit in white light. While fit and finish is impressive, the cabin is still plasticky. In terms of space, the Sunny continues to offers plenty of it as before, especially for the rear passengers. 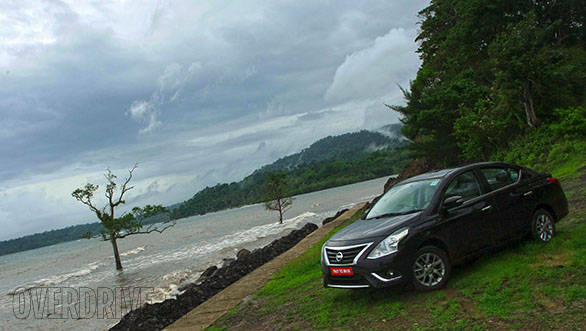 Driving around the Andamans is a unique experience, the roads here are twisty, narrow and quite involving. The Sunny may be unusually longer than competition but still grips quite well and the long wheelbase doesn't really affect dynamics that much. The ride isn't the best we've come across in this segment but it's still quite good and absorbs undulations and broken surfaces. 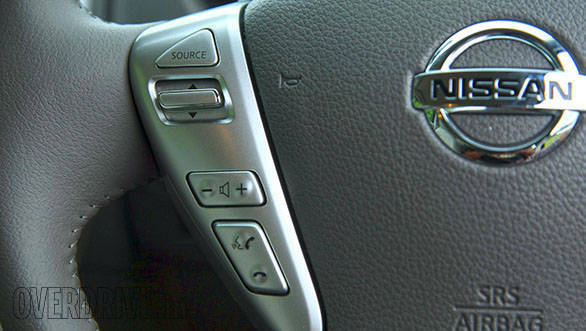 Nissan claims that the NVH and the ride have been improved too. The HR15 petrol and K9K diesel engines have been retained but the latter gets reworked mapping for better performance as well as efficiency. We however didn't find that much of a difference. The 1.5-litre petrol is offered in both five-speed manual and CVT variants and produces 99PS at 6000rpm and 101PS at 5600rpm respectively. The diesel meanwhile can only be opted with the the manual box, max power being 86PS available at 3750rpm. The petrol motor is a peppy unit and ideal for driving in town. The diesel motor on the other hand offers good low end torque but one needs to shift gears quite often to stay in the power band. Gear shifts could have been smoother and more precise. ARAI figures for the petrol CVT is a claimed 17.97kmpl, making it 1.02kmpl more economical than the manual variant, the diesel now returns a slightly higher 22.71kmpl. The Sunny will be available in eight variants namely - XE, XE D, XL, XL CVT, XL D, XV D, XV premium pack 1 and XV premium pack 2. All variants offer ABS + EBD and driver airbag as standard while only the XV variants get an additional passenger airbag as well, the XV premium pack 2 even features side airbags and leather seats. Prices are expected to be similar to the outgoing model while the new premium pack variant is expected to cost Rs 30000 more. Overall, the new Sunny is more a facelift model with the addition of a few extra comfort features, the diesel motor efficiency and performance is claimed to have improved but only slightly and it is barely noticeable. 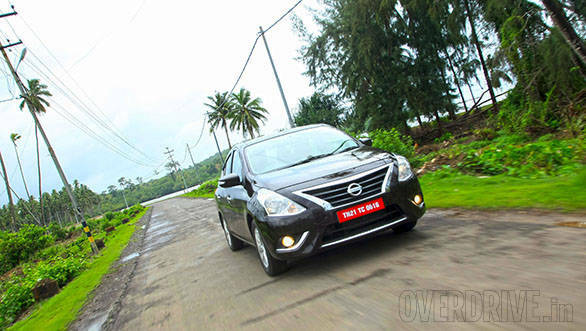 However this update is the right way forward for Nissan, we think the new Sunny is a good alternative to the compact sedans that seem to be doing so well in the country today.